Home > consciousness, philosophy, physics	> Three Dimensions of Time? Another way of thinking about subjectivity (as I have modeled it with the multisense continuum as sub-personal, personal, and super-personal ranges of awareness) is that time has three dimensions. Unlike the three dimensions of space, where the dimensions are presented as converged and simultaneous, the three dimensions of time are more like parallel gears or lenses which are relativistic to the scope of the participant’s awareness rather than to the position of their body. In short, as the structure of space resembles space itself, this new model proposes that the structure of time should be understood in a progressive way, as a multi-stage evolution of structure which is smeared across the totality of interior perception. If that were true, then my candidates would be as follows, and you can think of them as three levels of description of a clock, oscillation, progression, and orientation. 1. Oscillation. On the lowest level of accurate clocks, there is a recursive sensory-motor engine. Be it a bobbing float, a swaying pendulum, a spring, or a piezo-electric material being stimulated to vibrate, the source of momentum for a clock is the tension between release and restraint, resolved as oscillation. We don’t know that an electric current on a quartz crystal generates an experience of release and restraint, but I suspect that on it’s own molecular scale, there is such an experience, 32,768 times per (human scaled) second. A very simple water clock could consist of just a leaky measuring cup. In that case, there would not be an oscillation, but a smooth flow. If you watch flowing water, however, it is your awareness which tends to oscillate, tracking between the recursive rushing of the flow through a fixed position and the fluidity of the total motion downstream. 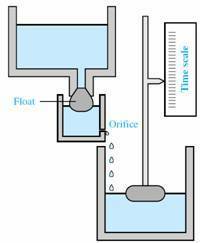 In a water clock, the amount of water which leaks out is abstracted quantitatively. When we say, for instance, that there are X number of gallons in a pool, we don’t mean that there are literally gallon-sized units which water comes in that are all squeezed into the pool. We mean there is enough water in the pool to fill X number of gallon jugs if we wanted to. This is a bit of a detour, but it is important because we seem to have forgotten this in physics and now routinely mistake our quantum measurements for the underlying phenomenon which drives that which we believe we are measuring as well as the measuring device itself. The more relevant point here, is that while the lowest level of time can be either the smooth fluidity of force* or the oscillating dissipation of that force. With the oscillation we get a better sense of the recursive quality of the sub-personal experience. The sub-personal is characterized by its intolerable recursiveness. So generic and monotonous is the stream of identical passing moments of the oscillator that our attention cannot face it for long. We need hands or digits or hash marks on a ruler to help us keep track of their progress indirectly. To a human mind, the experience of the trillions of micro-organic presences which make up our body at any given moment, is recursive madness. The experiential qualities of molecular and quantum levels beneath that, can only be more insanely generic, vast, and uniformly repetitive. 3. Progression. 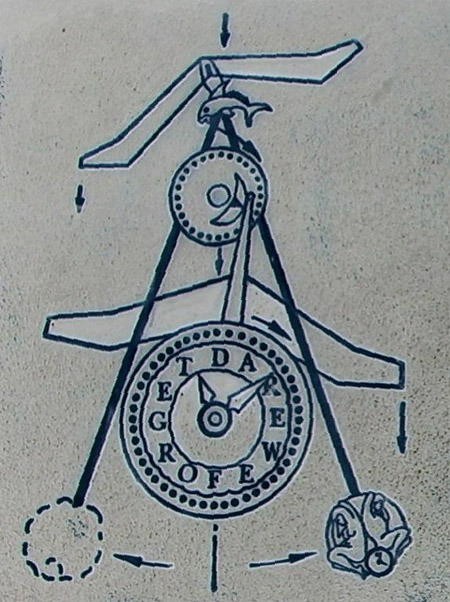 In the middle, personal range of chonometric experience, the hands of a clock are used to denote the wheel of the sun’s progress across sky. Because of the pervasiveness of the sun’s presence, it is only necessary to capture twelve hours at a time, since it should be obvious whether an hour is am or pm by countless perceptual cues internally and externally. The sundial or mechanical clock with round face emphasize the cyclical nature of the progress of time, really a helical sense of second, minute, hour, progressive cycles and day/night oscillating cycles. In modern time, the worldliness of the solar clock has been shattered in favor of digital time. In digital time, cycle and oscillation are pushed into the sub-personal range of awareness to yield a pure coordinate space. Time no longer passes, rather it is set and synchronized to a satellite signal. The implications of this psychologically are a double edged sword. Digital time is precise, accurate, and uniform, but its granular nature has replaced the flow of time with dehydrated instants. The meaning of time is purely relative now, an enumerated code tied to geography and policy. Time doesn’t so much ‘march on’ anymore as it does march in place on multiple levels. Time is now an infinite commodity of finite moments, meaningless, disconnected, and interchangeable. We have, in a sense, stopped time while in another sense, we have made time more inescapable and relentless. We are pushing the personal sense of active progress and flow into an impersonal sense of fixed point geosynchronous addressing. Fortunately we still feel our own lives personally as progress and growth. Our cycles are longer and more spacious than they were a century ago, causing strange red shifting and blue shifting in the extension of childhood, adolescence, and old age but contracting adulthood. Stripping away the superstition of the past has reduced the human life from a pageant of astrological or religious significance ordered by time to its bare bio-genetic mechanisms. Aging is nothing more than a set of symptoms to be banished through medication and cosmetics, diet, and exercise. Otherwise, one year is much the same as the next. Our window of progress has been contracted to match our pay cycle or school schedule. Groundhog Week is always beginning, ending, flying by, or dragging. Progress is about passing significant milestones. We talk about dates A.D. or B.C. (formerly Before Christ, not secularized as Before Common Era), or characterize them in Ages, Bronze, Iron, Industrial, etc. In our own lives too we think in terms of relationships, residence changes, jobs, or other shifts in the content of our life story – a matrix of befores and afters. These markings in our personal progress are totally unlike the impersonal measures of oscillation and cycle, which are fixed recursively. The chronometry of our lived experience is not so much marked as it is ritually scarred. From the inside, the clockwork thematic and plastic. It retains the irreversible arrow of time, but hyper-extended into aching nostalgic ruins and amputated in chronic disillusion. The retelling of stories and reimprinting of memories smooths out the rough edges, compensates for the incompensible and runs out the clock on personal ages we can’t bear to revisit in their full glory. Memory is a mindfuck. Part propaganda, part revelation…which leads me to. 3. Orientation. Clocks and calendars provide us with a birds-eye view of time. Beyond flow, oscillation, and progress, the wheel or grid of time gives us a presentation of time as universal collection. A science fiction zodiac of possible futures. If oscillation begins with outward flow, then it ends with containment within. Flux and flow persist as perturbations of currency, ripples on the surface of an Akashic plenum of eternity. Finding our way to and from this ocean is perhaps the greatest mystery – one which we have tried to solve with intuition and divination. This is the scientifically despised layer of time which can be described as super-personal, or super-signifying. Jung talked about the collective unconscious, echoing what every mystic tradition has said about a world beyond time itself – a nexus of hyper-convergence where meaning originates or terminates. Archetypes, symbols from dreams, alchemical models, all point to a kind of absent presence of a divine Totality. Campbell’s ‘hero with a thousand faces’. A bottomless well of teleology and significance – images, encounters, mythic adventures. Perhaps as the thin trickle of water clock drips out of its vessel, so too does the trickle of possibility drip into our imagination. Unlike the despised drip-drip-dripping of the Sub-Personal level Chinese water torture, the Super-Personal drip into our Personal ‘now’ is generally welcome, if not desperately so. Novelty and variety are precious and we are fiercely proprietary about them. We want to be the first to know, to see, to feel the future for ourselves. ‘What’s next’ is the hope for release from cycles and oscillation – for transcendence and cessation. “Tis a consumation devoutly to be wish’d”. *flowing from private sensory potentials to public motor presentations (aka thermodynamic entropy, or the arrow of time…a continuous public declaration of pure irreversibility, which is the source of all motive, all expansion, or fractal self-diffraction of the cosmos). Why do pitches separated by an octave sound “the same”? Who’s In Control?